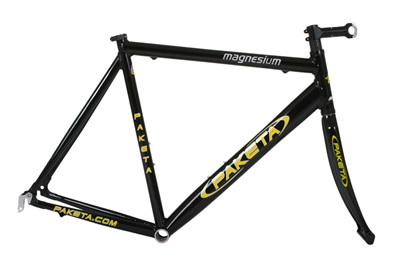 Paketa’s magnesium road racing frames are light, stiff, and fast! Aerospace engineering enters into the double-butted, bi-ovalized, and aero-shaped downtubes. 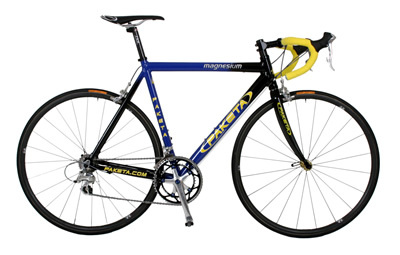 Thousands of road kilometers determined Paketa’s exclusive geometry, and years of experience have gone into perfecting the proprietary manufacturing processes. All this adds up to one thing: A frame light enough for the high mountains, aero enough for solo breakaways, and stiff enough for bunch sprints. Throw in the “X”-Factor (magnesium’s unique ability to tame road shock and vibration), and now you’ve got the freshest legs in the peloton! Hope there’s some room on the Trophy Shelf, you’re going to need it! Bottom Bracket shell faced and chased, ready for build-up!